Glewstone Court Country House Country House HotelGary & Karen Homewood have owned and personally run the Country House Hotel and Restaurant since 2014 along with their eldest daughter Amy and her fiancé Sam. They are justifiably proud of their team who consistently strive to deliver excellence in food and customer service providing the perfect setting for guests to create special memories. The Cedar Tree restaurant at Glewstone Court has been awarded 2 AA Rosettes for culinary excellence. 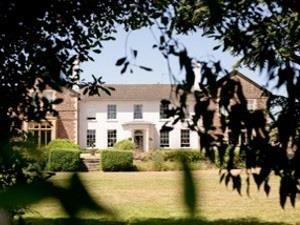 Glewstone Court Country House sometimes limits bookings to 2 or more days. The Gainsborough Suite has approximately 600 square feet of living space with a 7ft wide bed, separate en-suite bathroom with toiletries and an open plan lounge area with comfortable armchairs. Individual in style and decor and equipped with a flat screen TV, Tea and Coffee making facilities, homemade biscuits, bottled water, hairdryer, Wi-Fi access and room service. Due to the space it iserfect as a family room. You can be sure to relax and enjoy the stunning garden and countryside views. Gainsborough sometimes limits bookings to 2 or more days. One of our garden facing standard rooms with beautiful countryside views. The room can accommodate one super king bed or two single beds (on request) and can interconnect with The Wordsworth Room. The room is equipped with a flat screen TV, work desk and chair, hairdryer, toiletries, free wi-fi access and tea & coffee making facilities. Reynolds sometimes limits bookings to 2 or more days. One of our garden facing standard rooms with beautiful countryside views. The room has been recently refurbished to a high standard equipped with a flat screen TV, work desk and chair, hairdryer, toiletries, free wi-fi access and tea & coffee making facilities. It has an ensuite shower room. Shelley sometimes limits bookings to 2 or more days. The Wordsworth room is our superior room with a large floor space and four poster bed. Suitable as a family room accommodating up to three extra single beds and can interconnect with The Reynolds Room. Beautiful views of the Cedar Tree and countryside. En-suite shower over bath with toiletries, complimentary bathrobes, free wi-fi access, Nespresso machine, hairdryer and room service. Wordsworth sometimes limits bookings to 2 or more days.